I own a Toyota Prius and I'm very proud of it. I am concerned about the future of the environment and have for many years tried hard to contribute less to its destruction. For example, before my town recycled juice cartons, I smuggled them into a town that did! When research first began into how we could make cars that used less fuel, I decided that a combination of a chemical fuel burning engine, a battery and electric motor/generators would be the first step to gain wide acceptance. At that time, I imagined a series hybrid with a turbine engine driving the generator. Decades later, even though I was wrong about the engine, I was excited to learn that I would be able to own one of the first gasoline/electric hybrid cars to go into mass production. By coincidence, my previous car (a Mazda 626) was getting a little old for me (125,000 miles) at the time the Prius became available. I also had the money in the bank to pay the surprisingly reasonable price (about $20,000 plus tax). I know I could have bought a fine car for less money. I know I won't make up the cost difference in gasoline savings unless its price rises considerably. I may pay more for servicing (or maybe not, the first three years is free!) and end up in eight to ten years with something that is hard to pass on to a new owner (I hope that hybrid technology will advance quickly). All this is worth it for me to send a message to anyone listening that we must do something to stop degrading the environment at the rate we currently are. April 2012 Update - I still have the 2001 Prius, plus a 2006 Prius. My wife now drives the older car. I need not have worried about the general acceptance of hybrid technology and passing the older car on to a new owner. I can count at least six Prius that were bought by their owners largely due to my influence. I'd like to make it clear that by writing and enthusing about the Toyota Prius here I do not intend to imply that other hybrid and alternative fuel vehicles are any less admirable. In particular, the Honda Insight achieves better fuel economy than the Prius because it is a small, light two-seater. Honda also make a hybrid version of the Civic. There are some pure electric vehicles for sale that are perfect if your driving consists of short trips. The important thing is that we must stop indiscriminately burning fossil fuel and start buying vehicles that do everything that technology permits to reduce their environmental impact. California: Jim Klausen explores both past and future with pages on paleontology and the Prius. Under a picture of Jim and his wife Karen by their Silver Strata Metallic, you can read about how the Prius presents a "normal" car's exterior hiding its sophisticated inner workings. Leigh Brasington likes foreign travel but has an Electric Green Mica Prius waiting for him when he gets home. Florida: Coastal Electronic Technologies' principals own a Prius and have created a number of accessories for the car such as an easy-to-install remote cruise control, a remote trunk opener, bike/cargo rack, arm rest, etc. Since the car is so quiet, it's sometimes hard to tell if the engine is running but Coastal's engine run monitor can help you keep tabs on it. Germany: Ernst Schmidbauer has made measurements of battery current on his Prius which have helped the Yahoo! discussion groups understand the car. He can drive as fast as he likes on the Autobahn, but his speedometer reads 7% high by government mandate! 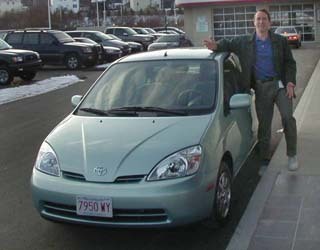 Minnesota: John1701a's site focuses on the fun of Prius ownership with an extensive photo gallery. There's an overview of how the car works based on the Energy Monitor display and many myths about the Prius are debunked. If you're worried about the Prius in a cold climate, check out the outside temperature reading in some of John's Energy Monitor photographs! There are many Internet discussion groups related to the Prius and other hybrid and alternative fuel vehicles. Below, I list some that I've found on Yahoo! Note that in order to read the posts and follow my links to these messages you will need to sign up on Yahoo! and join the appropriate groups. It's free and you will not receive unsolicited mail (spam). If you select not to receive posts by e-mail, being a member of a group has no effect on you at all unless you go to the group to read or post messages. Last edited June 26, 2002. All material Copyright © 2001, 2002 Graham Davies. No liability accepted.